Andrew Learmonth hit his first half century of the season and then praised the other batsmen in the top order as Watsonians defeated Aberdeenshire to remain top of the CSL Eastern Premiership on Saturday. With a lot of rain around on Friday there were doubts about matches going ahead, but Myreside was playable for a 12.15pm start and the visitors put Watsonians into bat. With Brendan O’Connell missing, wicketkeeper Andy Hislop was promoted up the order to open the batting with Learmonth. The duo batted a lot together last summer and they got things off to a good start, putting on 73 for the first wicket with Hislop losing his wicket for 30. Left-hander Learmonth continued to help his side build a good total along with captain Ewan Chalmers. The former reached his 50 but was out caught and bowled by Aberdeenshire’s Harsha Cooray for 54 just before the drinks interval. 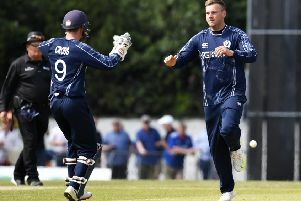 His innings gave Watsonians a platform and Chalmers, who is now third in the league’s top run scorers’ chart, went on to make an unbetaen 52. He was well supported by Schalk Conradie (36) and Henk Conradie (20) and when the rain came in the 43rd over he was batting with his brother Andrew. A that stage the hosts were 216-4 and looking likely to score around 270 from 50 overs, but a heavy downpour cut their innings short. When the rain stopped Aberdeenshire needed a revised 249 to win from 41 overs. By drinks in the 21st over they had advanced to 81-2 and still had dangerman Cooray at the crease. However, when Calum Howard was out for 66 and Cooray was run out for 50 by Andrew Chalmers they were in trouble and in the end they fell short in their run chase. Watsonians won by 39 runs (via the Duckworth/Lewis method) with Ally Sadler taking 3-59 and Andy McKay, Alec Sim and Henk Conradie all grabbing wickets. Learmonth said: “I always enjoy batting with Andy Hislop so we were pleased to get the team off to a good start in this match and then the other batsmen just took things on from there. “I was pleased to contribute a decent score while Ewan Chalmers continued his good form and the Conradie brothers chipped in well. “When the rain came we were not sure what might happen, but when we did get back out there the bowlers did a great job to restrict Aberdeenshire to 209-8. Elsewhere in the Capital, there was frustration in the top flight as matches were cut short by the rain. Carlton had made 133-5 at Goldenacre against Heriot’s while Mazars Grange were well-placed on 259-5 against Falkland in Stockbridge before rain fell and no results could be recorded. Glenrothes defeated title chasing Forfarshire and Arbroath beat Stoneywood-Dyce. In the Baillie Gifford ESCA Championship only two matches were completed, but Marchmont’s bowlers were on top form to guide them to victory. When the Cavalry Park men were bowled out for just 110 batting first against RH Corstorphine, things were not looking great. However, bowlers Matt Loeffen and James Blackmur were in inspired form defending the low total, taking 4-17 and 3-20 respectively, to see their side home by 11 runs. Stuart&Stuart Penicuik went third with a 103-run win over Edinburgh, skipper Chris Ashforth claiming 4-14. Meanwhile, Penicuik’s Murgitroyd Masterton Trophy final with Grange has been rearranged for this Friday evening at Grange Loan (6pm).